Doctor Who: Revisiting DALEKS IN MANHATTAN / EVOLUTION OF THE DALEKS | Warped Factor - Words in the Key of Geek. Dr Moo takes a look at a disappointing mess of a Dalek story. 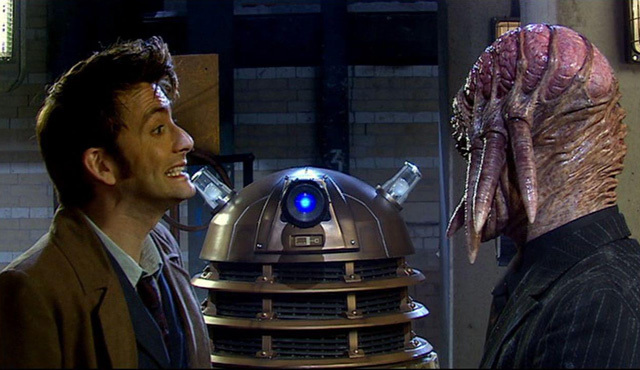 Daleks in Manhattan/Evolution of the Daleks is a story of great extremes both within its narrative and how said narrative is presented on screen. The basic story sees the Dalek “Cult of Skaro” arrive in the middle of the Great Depression of 1930 where they exploit the extreme highs and lows of that context to their own ends. On paper it’s an extremely good idea for a story, one that’s just begging to be told, so why is it that it doesn’t work? How can such a good idea result in such a flop in its realisation on screen? The story starts and we’re in New York at a theatre (bringing back memories of the masterpiece-doesn’t-do-it-justice that is The Talons of Weng-Chiang) and we’re introduced to Tallulah and her boyfreind Laszlo who mysteriously disappears. All very interesting so far, but the first signs that this is not going to be an all-time classic comes when Tallulah speaks to him and we hear an American accent so unconvincing that not even Peter Purves in The Chase can compete, and as for her relationship with the Pig Man Laszlo, I give them three days tops. Miranda Raison is a capable actress but you wouldn’t know it from watching her here. Thanks in no small part to that, Tallulah is an extremely irritating character, with her rough tough dialogue being some of Doctor Who’s worst writing ever and her girly screaming enough to make your pets howl with discomfort. But it’s even worse when she’s forced to sing. ...it ceases to feel like you’re watching a BBC high concept family drama and instead you could be convinced that you’re watching some poorly-made B-Movie on an obscure satellite channel you previously had no idea even existed. He tries, oh how he tries, to deliver his lines well but he just can’t! He even gives Sec a stutter and pauses between words in odd ways gasping for breath to portray the difficulty for a Dalek to adapt to life outside the casing, but not even an inspired touch like that can save the character from a complete lack of credibility. That lack of credibility comes from a variety of sources. Most prominently of course is his appearance. 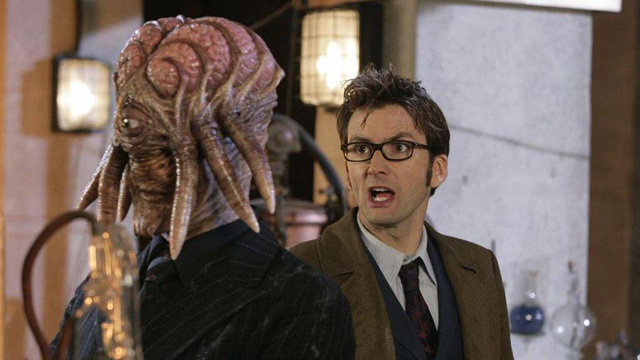 The best way I can describe the Human-Dalek hybridised version of Sec is that he’s what you get if you throw Skaroth (City of Death) and Erato (The Creature From the Pit) in a blender and give the resulting mess an asthmatic condition before putting it in a pinstripe suit for no apparent reason, and realised by a pornographer; he genuinely looks THAT ridiculous. 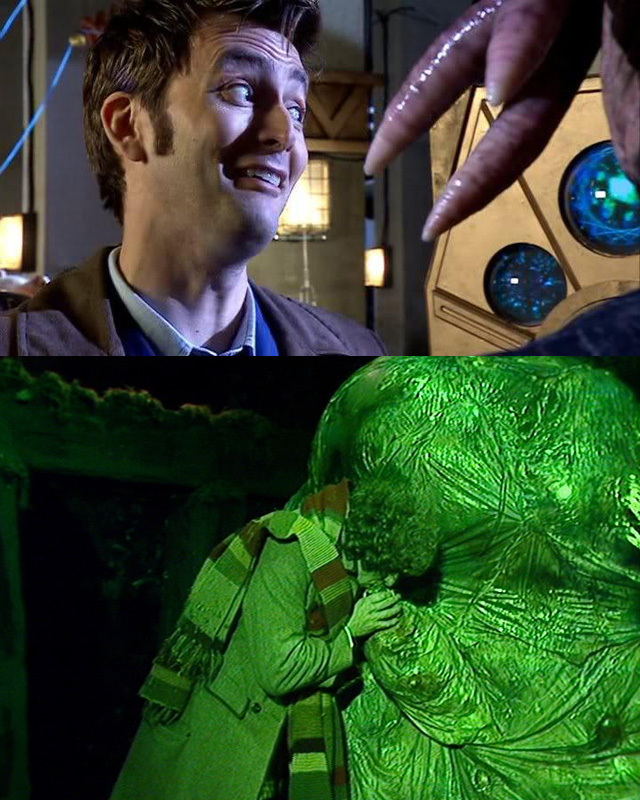 At least David Tennant decides not to channel Tom Baker on this occasion. Then there’s Dalek Sec’s complete lack of credible motivations. Why does he think the Daleks need to be upgraded into humanoids when he’s always been programmed to believe his own species is superior to literally everything that ever existed? Why does he need to go about kidnapping humans when he knows full well from history that humans are perfectly capable of working with the Daleks by choice? And, most inexplicable of all, what the heck is that business with the Pig Men all about??? A lack of credibility is sadly extended to the Doctor in this story too. His promise to Martha of “just one trip” was extended last time in Gridlock to count as one to the past and one to the future. How does he think he can justify this one??? He’s treating her badly, leading her on, and this is a big character flaw of the 10th Doctor - that he mistreats his companions. It’s clear that Martha is interested in him – I don’t buy the excuse that he can’t tell – so given that he doesn’t share her feelings why does he lead her on like this? He’s over 900 years old, he should know better than that. As well as that, this is 10 at his most arrogant. 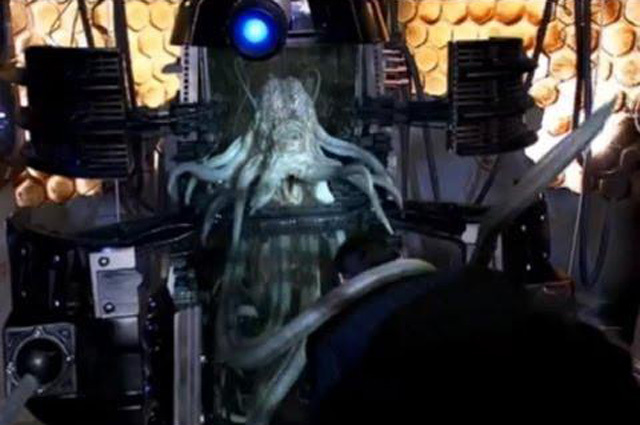 At one point he begs the Daleks to kill him (twice) because he doubts that they will and at another point he witnesses the extermination of an entire race of Dalek-Human hybrids and gets all high and mighty about how bad that was, despite having committed a genocide of his own (The Racnoss) three stories earlier. I’ve always had a problem with the 10th Doctor and recently wrote an entire article articulating it so I won’t go into that now, but all his worst traits are on display here. On a related note, why does he take so long to identify the dead Dalek mutation when he’s seen them so many times before? Now I mention it, why does that mutation look more like a Rutan than any Daleks I’ve ever seen? While I’m talking about the logical issues of this story it amazes me that I haven’t yet mentioned the way it treats solar flares like lightning (not even Christopher Hamilton Bidmead was as bad as that), or the nonsense cop-out that is Dalek Caan’s emergency temporal shift, or the stupidity of the moment when Martha asks a Dalek a question and it answers her, even though she’s his prisoner. Do Daleks always answer their prisoners’ questions? This is a real problem in all the Davies-era Dalek stories in fact, but never worse than here. At least in the other ones the Daleks are about to immediately kill their victims so have nothing to lose by answering, not so this time. And that’s just about it for this story. While on paper it’s all a very good piece of Doctor Who, in practise it’s anything but. The supporting characters are annoying cardboard cutouts, the villains and heroes alike lack credibility, there’s no logic behind anyone’s motivations and there’s absolutely no reason to spend two episodes on it. I just don’t know what they were thinking, I really don’t. It’s a shame because of the idea behind the story, Daleks converting humans into Daleks, could actually be a very strong concept if it were done better. If only it weren’t so flawed on almost every level it could be an all-time classic. Sadly that’s not how thing panned out and what we’ve got is a story that’s better as an idea than as an actual story, similar to more recent train-wrecks like Sleep No More or Kill the Moon, though by comparison this story is leagues ahead of those. In fact it may be in the top three of series three by default. Daleks in Manhattan/Evolution of the Daleks may be flawed but at least it knows what it it’s trying to be (unlike Gridlock), it doesn’t come across as trying too hard (like The Shakespeare Code and 42 both did), the monster looks marginally less ridiculous than it could’ve done (which makes it better than The Lazarus Experiment) and it maintains a constant quality rather than frustratingly derailing slowly (like three-parter Utopia/The Sound of Drums/Last of the Time Lords). My goodness, series three is a weak run of episodes! That something like this should be in the top three of its season is not necessarily a good thing but may make it seem more palatable if watched within its context rather than as a standalone. That to me is how best to approach this story and I think you’ll get more out of it if that way. But I, for one, have no desire to watch this again.